Quite a while back, Olympus hinted at their first true macro lens for Micro 4/3…the 60mm f/2.8. It’s taken a while to come to market, but it finally saw official release this past September. I was lucky enough to pick one up shortly thereafter. Olympus priced this lens competitively, at $499, coming in well under the asking price for the other native macro lens for Micro 4/3, the Panasonic Leica 45mm f/2.8 OIS. With a longer focal range, with equivalent field of view like that of a 120mm lens on full frame, the Olympus 60mm Macro will allow for a little longer working distance, which can be most welcome when shooting insects. So how does the new Olympus stack up? Olympus has released a number of very high end prime lenses over the past two years, though construction between them is somewhat schizophrenic. You have the high end silver/champagne all metal construction of the 12mm f/2 and 75mm f/1.8, the still silver, but plastic construction of the 45mm f/1.8, and now the still plastic, but black finished body of the 60mm f/2.8 Macro. The lens is long and skinny, roughly the same size as the M.Zuiko 12-50mm zoom, but thinner. The lens is relatively lightweight, and feels great in the hand. Despite its plastic build, the lens is solidly constructed. There is zero flex anywhere on the lens body, and everything is tightly constructed. The wide manual focus ring is well damped and feels really wonderful in the hand – probably the best of any of the Micro 4/3 lenses. The lens is only the second Olympus lens to have weather sealing, allowing for inclement weather shooting when used with a camera like the Olympus OM-D E-M5 or the Panasonic GH3. The lens uses internal focusing, so the length of the lens does not change during focusing, nor does the front element rotate. This is a great feature to have in a macro lens. There is an interesting focus scale that appears as a moving orange line in a clear window on top of the lens (when mounted). This scale is really only useful in the macro range, as beyond 0.4m, the line stays pegged on infinity. Still, it’s a handy way to note the current magnification when shooting macro. Again, however, I must chastise Olympus about the lack of an included lens hood. 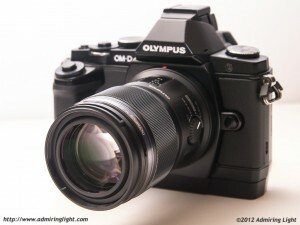 Why Olympus insists on gouging the customer by making them pay extra for a hood is beyond me. Panasonic includes hoods on all of their lenses, and at least Canon includes them on their high end glass. Olympus doesn’t include them on ANY Micro 4/3 lens. The hood for the 60mm macro is a unique sliding design, but right now it’s not available from any retailer I’ve seen as of November 2012. When available, it’ll set you back $50. The Olympus 60mm Macro features Olympus’ MSC autofocus motor, which allows for very quick and silent autofocus operation. Along the side of the lens is a focus limiter switch allowing you to select the macro range from 0.19m (1:1 magnification) to 0.4m, the whole focusing range from 1:1 to infinity, or the more ‘normal’ focus range from 0.4m to infinity. There is one more setting, which is spring loaded, marked “1:1.” Flipping the dial to this will immediately bring focus to the 1:1 position, and then resettle in the 0.19m to 0.4m setting. This is a great feature, allowing you to quickly go to 1:1 and then switch to manual focus, rather than rotating the manual focus ring many times to get to 1:1 magnification. When using the lens with the focus limiter set to engage the entire range, autofocus operations can slow down a bit, as the lens takes a fair bit of time to go through the entire range. However, if your desired point of focus is close to where the lens is focused, the AF will lock on quickly. However, I strongly recommend using the focus limiting switches, which drastically speed up AF operation on normal subject distances. The ‘break point’ of 0.4m is also really nice, as you generally can shoot in 0.4m to infinity setting for almost all shooting except very close up work. As mentioned earlier, the manual focus ring is beautifully damped, and fine-tuning focus with manual focus engaged is very precise. However, in the macro range, it can often take MANY turns of the focus ring to move from, say, 1m to 1:1. This is where that little 1:1 toggle switch comes in very handy. I wonder, does the lack of a hood impact the image quality of the 60/2.8? Are we in a “post-hood” era, thanks to fancy coatings? No, we are not in the post-lens hood era. A lens hood was and still is a necessary and useful addition. I think you should use one whenever you can. It’s such a waste of energy and time if a photo is weakened or even ruined by flare or low contrast. It’s just bad practice and amateuristic to not use a lens hood. +1 Just buy the damn hood and use it. It doesn’t add any noticeable weight and I believe the hood for this particular lens is of the sliding type, so it will hardly take up any extra space in your bag. I own the lens too. While I agree with almost every assessment you made, your “cons” conclusion that this lens is not the smallest m4/3 lens is quite idiotic. 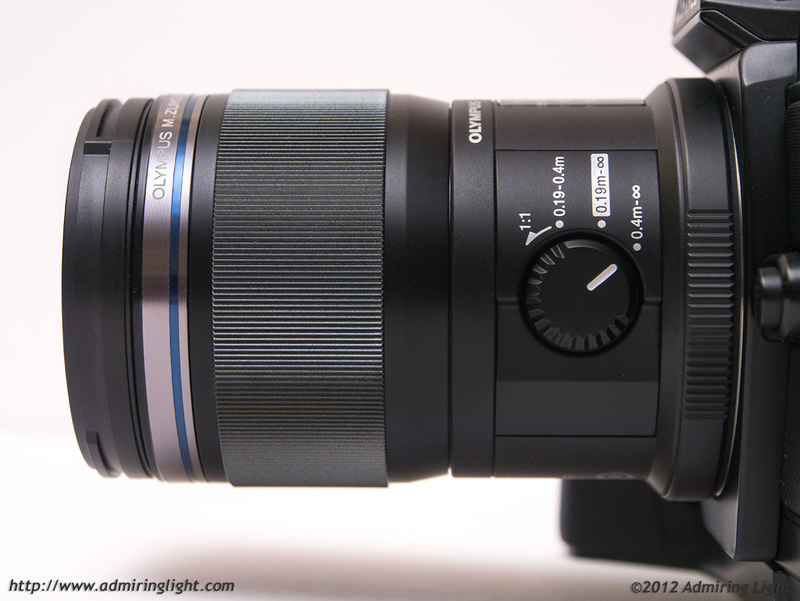 Do you really expect that each new m43 lens needs to surpass the already smallest. Please, remove this con item, because it does not make any sense, and gives the wrong impression what users really want and need. Not every lens needs to be a Pancake lens! To me, the 2.8/60mm is even surprisingly small and light. When I unboxed it, I could hardly believe that it is that small! 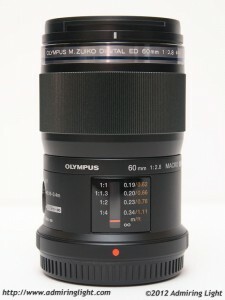 If you compare this lens with a FF equivalent like the EF 2.8/100mm IS L the Olympus lens is really small. I guess that the length of the lens is also due to the smooth and precise focus ring design. To date, I haven’t had any m43 lens, which can focus manually so precise. And the 1:1 “dial” also works in manual focus mode! The Olympus 60mm is perhaps e most beautifully macro lens design ever. It should not be any smaller, the broad focus ring is an asset and not a obstacle (or a con feature, as you claimed). While I agree with you that the lens isn’t huge, and in fact is small for what you get, it is significantly longer than the Olympus 45mm f/1.8 (which shares the same absolute aperture size), and the Leica 45mm f/2.8 Macro (which shares its 1:1 capabilities and adds OIS). That’s all that list item was meant to do, and since you’ll see that my conclusion doesn’t consider anything on the ‘cons’ list to be even close to a dealbreaker, I’m going to leave it as it is. I did not say that the broad focus ring was a con…just that it was important to point out that it’s not a super tiny lens. Many people who read reviews only skip to the conclusion, and it is something that is to be noted compared to the only competition this lens has in the m4/3 space in the PL 45/2.8. It’s not a detriment to me 90% of the time, but the length DOES prohibit it from making it into my super tiny bag, which I generally use to take my 45/1.8, 12/2 and 25/1.4. The length of the 60 means that I can only fit it on the camera in that bag, so the length reduces by two full lenses the amount I can take in that bag. Now, 90% of the time, I take my Think tank Retrospective 5, which easily fits the 60 (and the 75/1.8, and other ‘bigger’ micro 4/3 lenses like the 45-175 (which is amazingly compact for it’s focal range, but still largish compared to the smaller primes), and the 7-14 f/4, which is, again, very small for a lens of that width, but large compared to many of the other m4/3 options. None of these are too large for me to carry or use, but it is worth noting, as many of these lenses can’t make it into my ultra-light bag like some of the smaller primes. The reason the 60 mm is so much longer than the 45 mm is that it has an internal focussing mechanism. If it would built like the 50 mm f2.0 (4/3) it could be smaller when set for infinity, but grows to twice its length when focussing very close. The internal focussing also make weather sealing easier to achieve. The Leica 45/2.8 is also internally focusing. I own the lens and I think it is rather long, too. I would list it as a con. Also, it’s rude to label someone’s thoughts as “idiotic”. The difference in size between my 45/2.8 and the 60/2.8 is something that matters to me. No, the 60/2.8 is not a big lens. In SLR terms it’s not even a medium-size lens. But it is bigger, and the difference is big enough that I can fit one more lens in my bag with the 45/2.8 than I’d be able to with the 60/2.8. I might buy the 60/2.8 anyway, but I would miss the absolutely tiny package of the 45/2.8. excellent review that focuses on ‘real life’ impressions – and happens to concur with what the technical shoot at charts reviews tell us anyway. good to have both kinds of reviews at our disposal. Nice review and sample pictures. How do you compare this lens to Olympus 75/1.8 for close up children portrait? I plan to buy one of them for my newborn portrait. Thanks. My best lens, since it is also great for portrait photography and of course marko photography, but also general photography where I do not want to get too close to the subject. It’s just a winner …..
Had thought about buying 45mm.f.1.8 lens for portrait photography, but now I am very much in doubt ….. I own this lens and I’m very pleased with it. It is as good as they tell it is. I’m using it on a Panasonic body rather than on an Olympus one, but still perform very well. Just need to use it carefully when hand weld becuause it doesn’t have built in stabilizer (I try to avoid slower speeds). I don’t understand why people say it is “long” or it is “huge”… in fact I found it so small and light, and when you open the box where it came in it looks like a toy lens. Still it feels solid and well build when you have it in the hand. 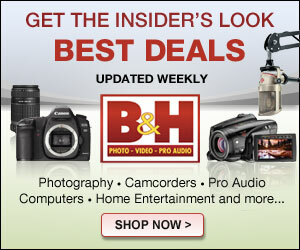 Great review, this lens is super sharp. I’m glad this lens is internal focusing so that the length is constant. This is a feature I think all macro lenses should offer. I’m also very happy about it being so lightweight, I can carry it on an OM-D E-M5 camera without problems such as hand fatigue. Olympus you’ve done very well. Everyone raves about the 45mm f/1.8 but I wonder if I could get by with just my 60mm Macro. Everyone raves about the 45 f/1.8 but I wonder if I could get by with just the 60MM to use as a portrait lens in addition to it’s Macro capabilities. My copy is soft on the right side when used for landscape photography. I have tried other copies of the lens and all have the same image softness. Maybe due to the macro lens being optimized for closeup focusing as opposed to decentering. Pingback: ????? M.ZUIKO DIGITAL ED 60mm F2.8 Macro???????????????????? | ????????????? Pingback: ????? M.ZUIKO DIGITAL ED 60mm F2.8 Macro ?????????????????? | ???????????? ?